An auction of works from the collection of the Hertfordshire County Council, which raised more than £444,000 in total, has drawn criticism from arts bodies and cultural figures. Just over 150 works consigned to Cheffins auction house in Cambridge all found buyers at a sale held yesterday. 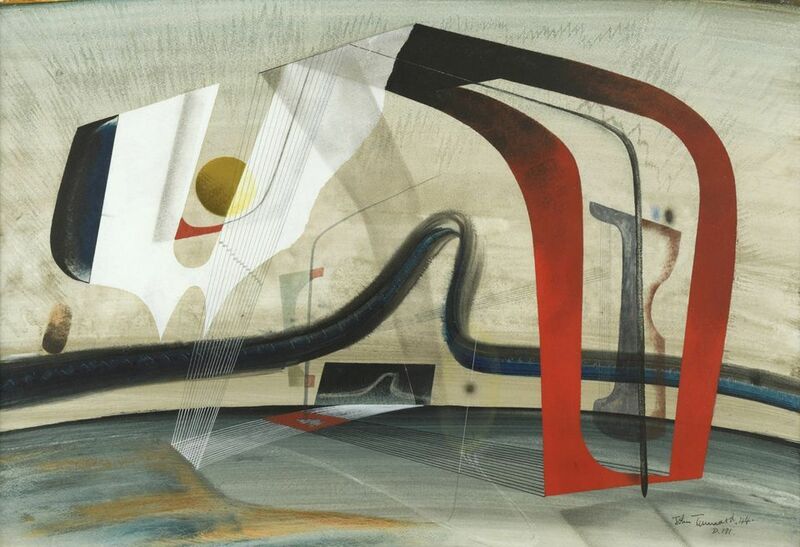 The top lot, a Surrealist work by John Tunnard entitled Brandis .44 (1944) sold for £37,000 (hammer price; est. £10,000-£15,000). Cheffins will offer another 300 works from the Conservative-run council collection in its interiors sales on 25 April and 23 May. The works are drawn from the Hertfordshire Schools Art Loan Collection—launched in the 1940s and comprising 1,496 works—which enabled children across the region to access works of art. “The service [school loan collection] has become less relevant to the evolving curriculum as students have had the opportunity to experience art in new ways, such as gallery visits or through modern technology. It was suspended in 2012 and permanently discontinued in 2017,” the auction house says in a statement. Last month, the council’s decision was also criticised by the Art Fund charity, which asked for reassurances that most of the proceeds will go towards conserving the works retained by the council. The councillor Terry Douris, the council’s cabinet member for education, libraries and localism, says in a statement: “It’s fantastic that [the] sale has raised more than we expected [around £300,000]. The money raised can be used to improve the condition and public visibility of the nationally significant sculptures we hold.” The council will also invest in its retained collection and is developing plans to increase accessibility, and improve the collection display and interpretation, he adds. More than 1,000 works will also be donated to regional organisations, the council says. But a spokeswoman for the Art Fund says: “The Art Fund, the national charity for art, still has serious concerns with Hertfordshire County Council’s suggestion that only a proportion of the monies raised from these sales will be invested into the remaining collection, and we still await an answer to our question over where the proceeds will go.” A council representative was not immediately available to comment.